Johannesburg and Dubai are the most commonly used international hubs to Lusaka. Other routings come via Lilongwe, Nairobi, Windhoek and Harare. South African Airways (SAA) runs daily flights from Johannesburg to Lusaka. Emirates runs one daily flight via Dubai. Proflight operates domestic flights to Mfuwe (the domestic airport you fly to in order to visit us). They are scheduled to line up with the various international arrivals and departures. We can arrange for a member of Tours Africa Office, Lusaka, to meet and greet you from your international flight and assist you through to your connecting flight. The charge for the meet and greet service is $80 for two people during regular business hours (additional fee applies for extra passengers or outside regular business hours). if going through Mfuwe airport, one of our guides will meet you, holding a SHENTON SAFARIS sign. The drive to camp takes approximately 2 hours 40 minutes—most of which can be spent game-viewing through some of the richest wildlife areas of the park. Shenton Safaris’ two Zambia glamping camps, Kaingo Camp and Mwamba Bush Camp, are world renowned for their ideal location in the remoteness of the South Luangwa National Park and offer first-class service and exceptional guiding. They are designed to transport you into the heart of the African bush and create a safari experience of a lifetime. 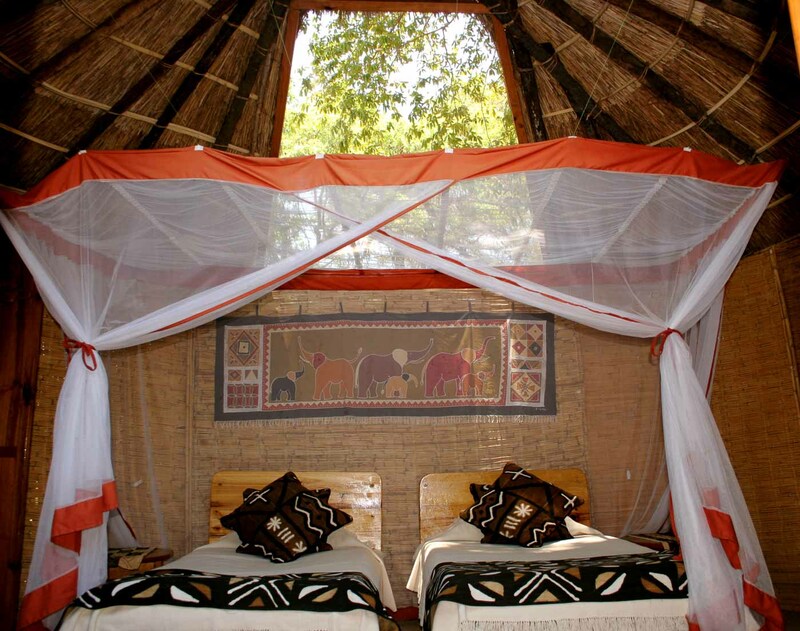 Kaingo Camp overlooks the Luangwa River deep within the prime area of the South Luangwa National Park. Kaingo’s relaxed, personal and friendly atmosphere offers its guests fantastic game-viewing opportunities within an area of incredible beauty and varied terrain. Built and run by Derek Shenton, son of Barry Shenton—former ranger in Luangwa and warden of Kafue National Park—Kaingo has many attributes from the Shenton family, ranging from the camp's stylish design and practical layout to the local farm produce. The large, centrally located, open-sided sitting room includes a dining area, library and Kaingo’s renowned thousand-year-old lead-wood bar. Large fly-wired windows provide stunning views of the river, and the complete absence of generator noise (we prefer solar power) means nothing but the wheeze-honk of a hippo interferes with the sounds of a lions roar, a leopards call or the early morning ‘drumming’ of the ground hornbill. In addition to the indoor en-suite bathroom, each chalet has a stunning outdoor bathtub with shady views of a pod of hippos. A special feature of Kaingo is the unique individual decks built out over the river in front of each chalet. From this relaxing vantage point, one can view game coming down to drink, basking hippos, aquatic birds, crocodiles fishing and daily elephant crossings. Mwamba takes only six guests in three reed and thatch chalets, uniquely designed with two soaring skylights (protected by mosquito gauze) set into the roof to allow you to sleep under the stars. These three bungalows have huge outdoors en-suite bathrooms with flush toilets and hot bucket showers. Our lighting is all solar powered and the complete absence of generator noise means nothing interferes with the morning chorus or the midnight howls of the hyena. The accommodation reflects a thoughtful balance between back-to-nature simplicity and essential comforts. Meals are of the same high standard as Kaingo, and the bush-style dining and bar area or “chitenge” is set under the deep shade of huge ebony trees entwined with python vines. A spectacular sundowner spot on top of a large termite mound and a glowing campfire under the night sky completes the camp’s friendly and personal atmosphere.